The book A.G.A.P.E. contains six steps to health: 1) admission of problems, 2) acceptance of condition, 3) allowance of help, 4) analyses of self, 5) amends making, 6) attending daily to prayer. 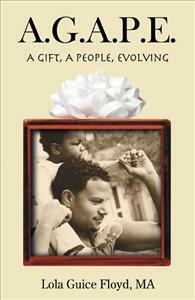 A.G.A.P.E: A Gift, A People Evolving is a socio-cultural and spiritual analysis that discusses the problems of young, black, enmeshed families, who deal with poverty, addictions, and crime which perpetuate a cycle of dependency. Lola Guie Floyd shows how the nuclear family can regain some of its power, and engage outside help to change the course of its future. This labor of love is a "must read" for all addicition counselors, therapists, ministers, and laity whose aim it is to assist in breaking the distructive cycle of chemical dependency. It gives much needed insight into the root of the problems facing the African-American famiy system with it's high incidence of chemical dependence. (alcohol and other drugs) Lola Guice Floyd has the personal and clinical experience necessary from twenty plus years of alcohol abuse and twenty plus years of soberity, coupled with her practial experience during those forty plus years of raising three children as a single mother, getting an education, working in the feild of recovery, opening a group home for recovering single chemically dependent mothers and their children, and being a loving grandmother to provide this much needed resource in a concise, informative, direct, and yet loving manner to those who desire "to be part of the solution". I much enjoyed reading this socio-cultural and spiritual analysis. It is recommended reading for "inner city" pastors and I believe her thoughtful presentation of a two-tier healing process is an understandable and workable method for African-American individuals and families. She gracefully offers hope and the ability to live with wisdom and serenity in recognizing and advocating that healthy families are always in the process of creating love through the giving of self. Lola Guice Floyd has put together a little book with a big message - - an excellent overview of a huge societal problem (the enmeshed young black family, representative of "a People") - - its genesis and present factors, and a way out of the problem. I am convinced that the author has looked into herself and subsequently into the suffering society and effectively encourages every reader to do so, through the HOW Principle and to make substantial recovery from whatever dysfunction that is troubling (addiction, cycle of dependency or fusion) and to become a more functional and productive member of the family and society, "evolving" or moving to a better condition in life. Through AGAPE, the spiritual love of God, she sees an opportunity and responsibility ("a Gift") that each individual has in forgiveness (the giving and receiving of love). I give my personal thanks, first for the author, and second to the author, for this brief, but effective work. She has helped me.